Daytime: Lake Martin. If we have little rain (like most summers) the fishing can be affected by water clarity. Lake Martin gets very clear (especially downriver below Wind Creek) to a point of 5-10 foot visibility. 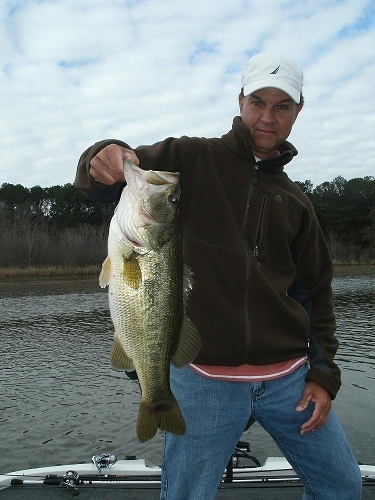 Bass feed by sight and fooling them often involves downsizing lures and fishing a little deeper than normal on Lake Martin. Light line and finesse fishing are the ticket to getting many bites during the day. 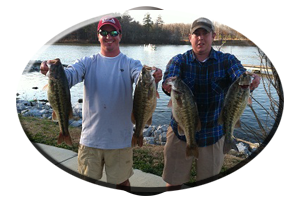 Fishing main-lake points is a good start for searching out deep water schools of both spotted bass and largemouth’s. 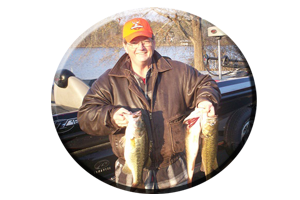 Ledges on the main lake and up in the deeper creeks also hold bass all throughout the summer. Deep-diving crankbaits fished with 8-15 lb. test Trilene Big Game line and Carolina-rigged plastics are good combos for searching out both of these deep water areas. Piers with brush around them located near deep water (and shade) are best for finding numbers of bass seeking these comforts during hot weather. Often small lures such as 4 inch worms or lizards, jig & pig combos and topwaters, must be downsized using line from 10-15 pound test. 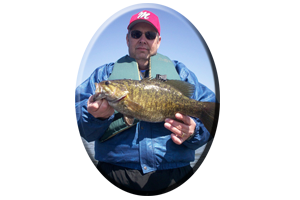 Jigging spoons or fishing with grubs, shad imitations or lead tail spinners along the ends of points, rock bluffs, around the ends of islands, along ledges and drop-offs, will take bass of all sizes. Search out water as deep as 10-30 feet (or deeper) when looking for these bass. When a few are caught, thoroughly rework the area with several different lures, various presentations and casting from all angles. If fishing from Wind Creek state park to the lakes headwaters upriver, you may encounter a little more color to the water. Here, spinnerbaits and buzzbaits can be fished on heavier line for cover-seeking spotted bass and some big largemouth’s. Flipping with worms, lizards, jigs, tube baits and fishing with deep-diving crankbaits are all dependable tactics for these upper lake areas. Many run-ins and rocky shoals adorn this upper portion of Lake Martin. Bass seeking the cooler water can be caught with jerkbaits, spinnerbaits, floating worms, rattling lipless lures, topwaters and mid-to-deep running crankbaits. Boat traffic and recreational jet skis may hamper your daytime fishing on this busy summertime lake, often calling for a nighttime fishing trip. Night: With very clear water fishing for bass at night can often be more productive than during the day on Lake Martin. Bass that drop their guard after sundown will move up on points, humps, islands and other shallow water areas, near the deeper water hangouts that most bass suspend around during the day. A lot of these bass feed at night and in some very clear water. This is where their eyesight traits are accompanied by picking up vibrations through their lateral line when they can’t see the prey. This means fishing with lures that emit a lot of vibration, flash and sound. Worms and lizards should have added rattles for more enticement. Jigs (with rattles) and a pork trailer are also good because these nocturnal bass can smell their prey as well. Adding fish attractants to your lures at night not only will mask human odor, but will help bass smell out the lure and find it easier. This, in addition, often makes them hold on a little longer, enabling you to get a better hook set. Some bass hold deep during the day, only moving shallow at night on Lake Martin. This is due mostly in part to boat traffic and water clarity. 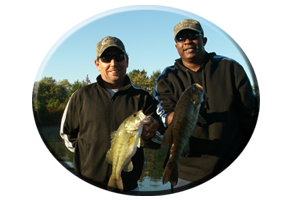 Deep structure bass can all hold at the same depth or suspended in comfortable waters, day or night. This means working a point (or other cover) all the way out to deep water. Some strikes can come right under the boat, so be ready. With very clear water, topwater lures can call bass out of deep water at night. At times, a lot of noise, action and staying in one spot, is needed for some very finicky bass. Noise makers such as pop-r’s, zara spooks, clacker or head-knocker model buzz baits, jitterbugs, prop-baits (see: www.SPRO.com), chuggers, minnow-type lures (www.LURENET.com) and baby (or tiny) torpedoes. These are all good lures for fishing in slightly darker water, stained water, or around well lighted piers. 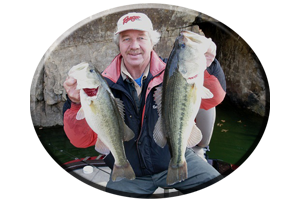 Quieter model lures such as frog and rats, soft jerkbaits or floating worms, crayfish and lizards may be needed on calm, windless nights in shallow water where Big bass can be finicky and very spooky. All of these lures and tactics are good for day or night fishing on Lake Martin throughout the Summer.